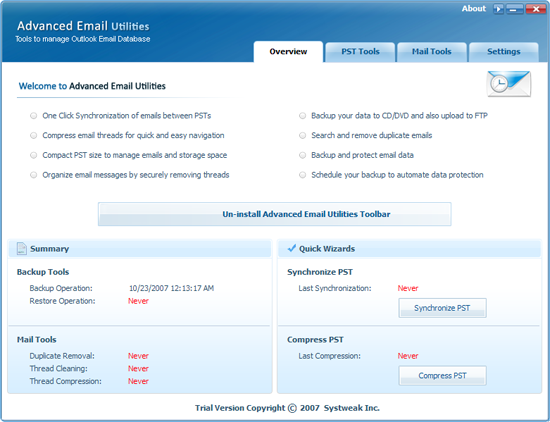 Advanced Email Utilities has easy packages of utilities to manage these manmade problems. It synchronizes (updates) mails. It compresses and removes threaded mails. The duplicate mails are also removed. The selected mails can be flagged for follow up actions. Mail backup is also possible. All these options are available for use with MS Outlook as plug-ins. * Do you face problem as your Outlook mails are not same on your computer and laptop? Advanced Email Utilities is one stop solution to all your Outlook mail related problems. It will keep your computer and laptop Outlook mail synchronized so that you don't have to rush to other system when particular mail is in demand. Advanced Email Utilities runs smoothly with MS Windows 2000/XP and Vista operating systems.It has also been made compatible with MS Office 2007. Advanced Email Utilities ensures your Outlook data is safe from future system crash or accidental wipeouts by taking regular backups. Qweas is providing links to Advanced Email Utilities 1.0 as a courtesy, and makes no representations regarding Advanced Email Utilities or any other applications or any information related thereto. Any questions, complaints or claims regarding this application Advanced Email Utilities 1.0 must be directed to the appropriate software vendor. You may click the publisher link of Advanced Email Utilities on the top of this page to get more details about the vendor.